In this volume, one of the greatest medieval historians of our time continues his rich and illuminating enquiry into the lives of twelfth-century women. Georges Duby bases his account here on a twelfth-century genre which commemorated the virtues of noblewomen who had died, and the roles they had played in the history of their lineage. From these genealogical works a vivid picture emerges of the lives these women led, the values they held, and the way in which they were viewed by the priest and knights who wrote about them. 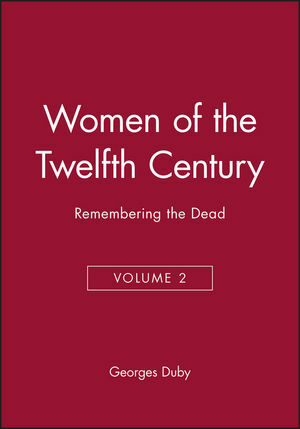 The first section outlines the way in which the dead, and the memory and tales of the dead, served to bond noble society in the twelfth century. The second draws on the Gesta, written by Dudo of Saint Quentin, and reflects on what it tells us about the roles ascribed to wives and concubines and women, in war and in power. The third and final section reconstructs women as wives, mothers and widows through the work of Lambert, Priest of Ardres. This book is part of a three-volume work on women in the Middle Ages. It will be of great interest to students and researchers in medieval history, social history and women's history. Part I: Serving the Dead:. 1. The dead with the house. 2. Women and the dead. 3. Writing about the dead. Part II: Wives and concubines: . 1. The genealogy of a eulogy. 2. The trouble with women. >Part 3: The Power of Women. * Second volume of Duby's celebrated trilogy on women in the twelfth century. * Theme is very topical and will appeal to social historians of the Middle Ages and those interested in the history of women. * Duby is probably the most well-known contemporary historian of the Middle Ages.